Visual Studio Code>Other>Dotnet CLI ExplorerNew to Visual Studio Code? Get it now. A cheatsheet for .NET Core CLI. Find the right commands you need without digging through the web. A Visual Studio Code extension that provides support for .NET CLI (Command Line Interface) in Visual Studio Code. Finc Commands through a multistep quickpick workflow. Once an option is chosen, an information message displays the right command.. The use can copy the command to the clipboard for further usage. The user can ask for details and a webview with usage and note is displayed. As the extension is standalone helper, no dependency is required before using it in VS Code. Click on the extension icon in the explorer. Search for dotnet explorer. Click install for the dotnet eplorer extension. 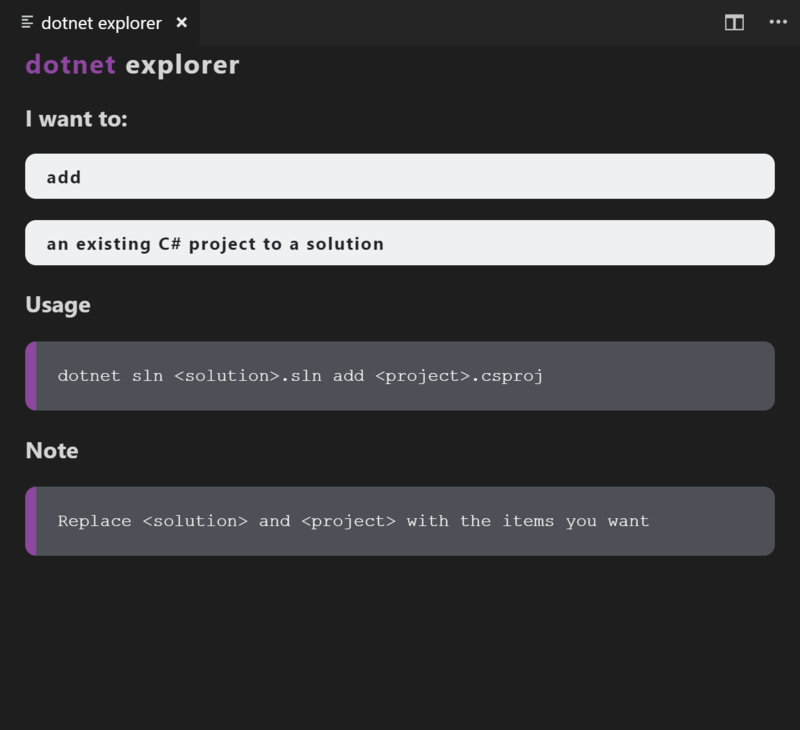 The dotnet explorer extension for VS Code helps developers to find the right dotnet cli commands using a simple multi-step dropdown input. Commands can be called pressing (Ctrl + Shift + p), typing the command name into the input bar, and selecting the desired command for the prompt list.